Happy Thanksgiving, everyone. A big Texans win in Detroit was hopefully accompanied by family, friends and good food. It’s a day of reflection and gratitude, and that goes for the Rockets as well. So here are 5 things that happened over the last year that were despised at the time, but today we can give thanks for these blessings in disguise. We’re coming up on the one-year anniversary of NBA Commissioner David Stern’s decision to veto the three-team trade that sent Chris Paul to the Lakers, Pau Gasol to the Rockets and Kevin Martin, Luis Scola, Goran Dragic, Lamar Odom and a first round pick to the Hornets, creating the most active thread in our forum’s history. Make no mistake, this was a shady move covered up by a longtime weasel, and we’re counting the days until Stern’s retirement (436 more, by the way), but this looks like a bullet dodged. The Rockets would have been a playoff team last year and likely a better team today had they made that move, sporting a PF-C combo of Gasol and Nene along with Kyle Lowry, Chandler Parsons and possibly a re-signed Courtney Lee (not to mention, Linsanity in New York never would have happened). But the Rockets would have still lacked a star foundation. They also would have forfeited both of their first round picks while being on the hook for over $32 million annually to their frontcourt, with both players showing signs of decline or weakness in the past year. The short-term goal of making the playoffs would have been met, but with fewer avenues to improve moving forward, the future would not be as bright. On April 11th, the Rockets, leading in the hunt for the 8th playoff seed, were set to host the Jazz in an important game. As Daryl Morey tweeted the day before, had the Rockets won, they would have had a 96% chance of making the postseason. They lost that game, and the next 5, essentially killing their playoff hopes. Had this not happened and the team made the playoffs, Houston’s first round pick would have gone to New Jersey/Brooklyn as part of the Terrence Williams trade. Not only would that have been a lost asset, but without that pick, it would have been very difficult to get as high as the 12th pick of the draft, which was the last possible spot they could be at to nab Jeremy Lamb (he was going next to the Suns). Lamb was a key piece of the trade to satisfy Oklahoma City in order to land James Harden. Tanking 1, Instant Gratification 0. 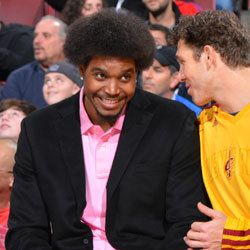 Where would the Rockets be if they had traded for Andrew Bynum? The Rockets seemed perfectly positioned this past summer to make a trade with the Orlando Magic, a team that was begging to be rebuilt. 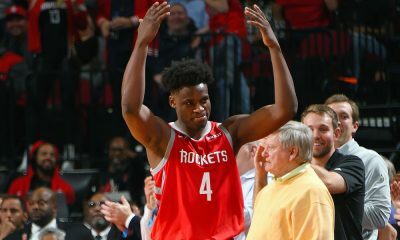 Orlando general manager Rob Hennigan wanted more from Houston, passing on Martin, one or two of the Rockets’ rookies, draft picks (including the coveted Toronto lottery pick) and the chance to unload some salary deadweight. Instead, Hennigan made the “Wait.. what?” move of trading Dwight Howard for Arron Afflalo, Moe Harkless, Nikola Vucevic and some lousy draft picks… and I can’t be more grateful for his ineptitude. 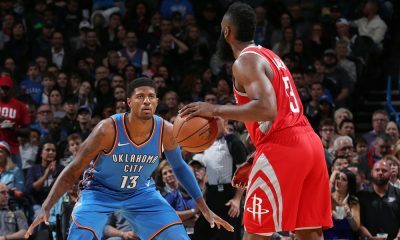 If the Magic had made the deal with the Rockets, not only would Houston’s cupboard have been bare when Harden suddenly went on the trade block, but they would be stuck right now with Andrew Bynum. The haircut alone is frightening, but he hasn’t played a single game for his new team and the buzz is he may need major knee surgery. The Rockets avoided an absolute nightmare. It’s hard to say that coming up short in acquiring the league’s best center is ever a “good” thing, but where would the Houston Rockets be right now had they put a Rocket red jersey on Howard? Their Harden trade package would have been used to get him. He absolutely did not want to be here and an extension wasn’t in the cards (doesn’t make financial sense, as he has shown in Los Angeles as well), so a lame duck season would have kicked off. With Jeremy Lin struggling and the Rockets hard-pressed for scoring, we would be besieged with the questions daily: “Is Dwight happy here?” “Will he re-sign?” The February 2013 trade deadline would have hung around this team’s neck like an anchor. 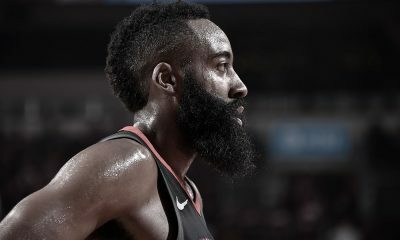 With a young core and an attractive All Star-caliber player in Harden locked up for six years, the Rockets can now afford to be patient and are in a better spot to lure talent than they would have been before. This was the better move. Rookie Terrence Jones was outstanding at the Vegas Summer League, and was quite effective in the preseason to boot. When Patrick Patterson went out, it was to Jones that Kevin McHale turned for spot starts. That he was going to be a part of the rotation didn’t seem like a question at all. On the flip side, Marcus Morris was one of two Rockets (Royce White being the other) that I thought for sure was going to be on the outside looking in for playing time. Morris was overshadowed in Vegas and his preseason was cut short in the first game by an injury. But when the regular season opened, McHale shockingly went with Morris and stuck with him. The second-year Kansas forward has been the team’s best scoring punch off the bench, averaging just under 10 points and hitting 39% from downtown. While the future is still bright for Jones, he’s not even old enough to drink yet… there’s plenty of time. Morris, however, needed this opportunity now, or things were looking bleak. Like a hot sale on Black Friday, Rockets fans got a sweet deal here — a 2-for-1 special — and now both players may very well pan out.